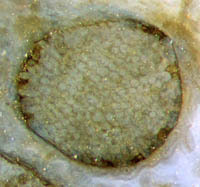 As a well known but peculiar fact, the "early land plants", more or less well preserved in the famous Lower Devonian Rhynie chert, are seen there abundantly as adult plants and as spores but very seldom as germinating spores and occasionally as mm-size plants, as the one shown in Rhynie Chert News 25. Possibly the early stages had been both short-lived and prone to fast decay. Therefore, the rare chert samples with "baby plants" as seen in Fig.1 deserve particular attention. The plantlets are occasionally seen as a few specimens scattered among large amounts of grown-up plants. So it has come as a surprise that about a hundred mm-size plants have recently been seen on the cut halves of a small sample of mere 60g. There they seem to be restricted to a layer of 2cm height. Fig.1: Rhynie chert with plant sections: Aglaophyton (above right), probably Rhynia (below), and randomly arranged mm-size seedlings of various orientation. Width of the image 11mm. As expected, they have got a cellular structure, which is indicated on the plantlet enclosed in white chalzedony in Fig.1, or seen clearly with higher magnification (Figs.2-6). Apparently they do not yet have developed a central strand. Among the numerous randomly oriented sections, those which incidentally are close to a plane containing the central axis can most suitably give an impression of the overall shape and a few details. As expected, the plantlets have got a base and a top or front end. There is a texture in the tissue near the base, with cells arranged in more or less diverging files apparently originating from one point below, as in Fig.2. The lowermost part seems to be broken off in Fig.3. 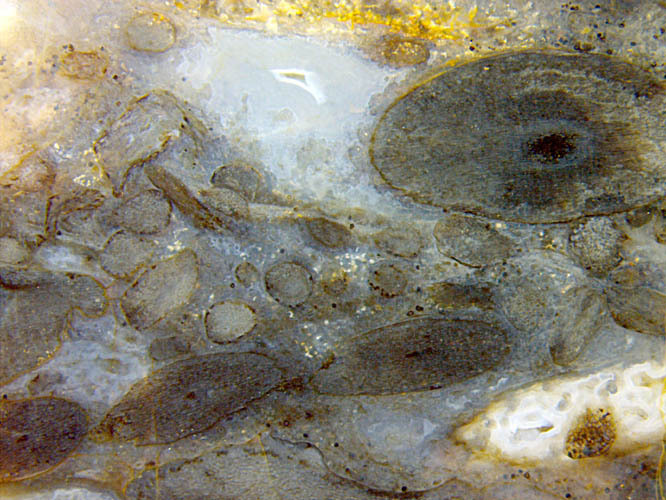 Also in Fig.3, a layer of cells on the left, set off from the tissue by a dark stain, looks like an epidermis. The approximate axial symmetry, which is apparent from nearly circular cross-sections as seen in Figs.1,5,6, may be spoilt by lateral bulges as in Figs.2,4. 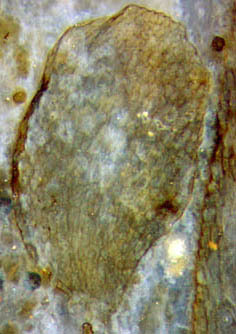 It has not been found out whether such bulges mark the onset of lateral branching, as suspected in a previous contribution, or the places where rhizoids grow from, as suggested by Fig.4. Fig.2 (below left): Plantlet, 1.4mm, with upward diverging cell files at the bottom and two lateral bulges. 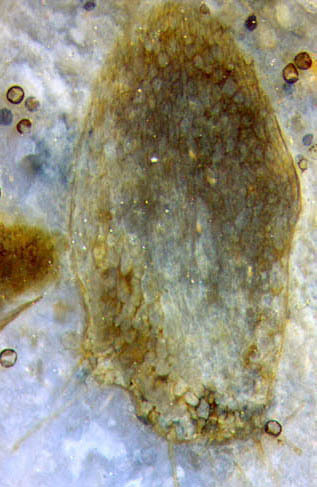 Fig.3 (next): Plantlet, 1.35mm, with stained epidermis and upward diverging cell files at the bottom. Fig.4: Plantlet, 2mm, with upward directed cell files in the middle, rhizoids on a lateral bulge and below. Note also a few spores (70µm) opening along their trilete mark. All figures show the same sample. Figs.2-6 are of the same scale. Fig.5 (above): Plantlet cross-section, width 0.7mm. Note the homogeneous tissue structure. 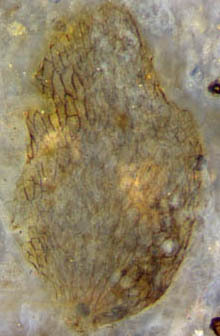 Fig.6 (next): Plantlet cross-section, width 0.9mm, with clearly seen epidermis above. 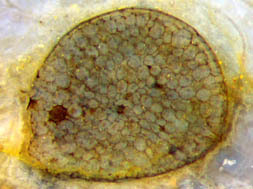 Archegonia are known to occasionally appear as dark spots sunken into the surface, superficially resembling the spots in Figs.1,5, but closer inspection reveals that the latter probably are cells affected by some fungus or microbe as it is also seen on adult Aglaophyton in this sample. There is one feature which seems to be in favour of a sporophyte interpretation: The lower end of the elongate plantlets often looks as if broken off somewhere (Figs.2,3). They might have grown from fertilized egg cells still sitting on the gametophyte, then become detached while the gametophyte decayed fast. It would be interesting to know at which stage of growth a central strand is formed. Perhaps the faintly seen files of elongate cells in Fig.4 and a cluster of small cells near the middle in Fig.6 are first indications of such process.